If you're looking for a flexible storage solution that also gives you a bench top work space, I don't think you're going to find a better built product for the money. Tool storage is a very particular thing. What I mean by that is that everyone has their own tastes, needs, and preferences. Milwaukee’s 46-inch tool chest and cabinet was very well received last year, and we are absolutely numbered among its fans. The combination of storage space, soft closing doors, and integrated peg board were just some of our favorite features. They also brought it in at a pretty attractive price point. Fresh off that success, we got to review their newest tool storage system, the Milwaukee 60-inch Mobile Work Station. What first attracted us to the new Milwaukee mobile workstation was its horizontal layout and solid wood top. It gives you a lot of storage while also providing a sizable work space. If you have a limited area in which to work, this may serve you better than a traditional vertical tool chest—and it will give you the same amount of storage space for our tools. When this product was announced I did something I don’t often do—I pulled rank and got it sent here for review. It arrived via truck freight, strapped to a pallet. The Milwaukee 60-inch mobile workstation isn’t something you’re going to casually toss into the back of your half-ton truck bed. It features a reinforced 6-gauge angle iron frame, which 20-gauge gauge steel drawers and sides, and six 5-inch industrial level casters for mobility around the shop. All-told, you’re looking at 403 pounds before you add the pallet and packaging materials…bring a buddy to help you load and unload this beast if you pick it up locally. If you have it delivered (like we did), be sure you know where it’s going on the day it arrives—you’ll likely want to assemble it (the casters, handles, and side shelf need to be installed) right where it’s deposited. That way you can immediately wheel it where it needs to go. I really liked the inclusion of the steel pegboard. For one, it helps keep your hand tools organized and within easy reach—but I also found it simple to mount my cordless power tools on it so they were ready to go when I was. Previously, I had stored my power tools in the corner on a traditional pegboard, but the location wasn’t optimal. 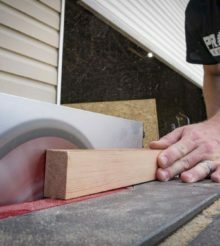 With the Milwaukee 609-inch mobile workstation I not only get a steel board that won’t take damage from the weight of my tools, I also have it front and center in my small work area so access to everything I need is far easier. On the right side of the Milwaukee tool workstation is an integrated power strip. With cordless tools being so dominant, it’s pretty much a must-have feature. Essentially it’s a power strip strapped to the side with an egress port for the cord. While you may think this is sort of a cheaper way to do this (as opposed to a custom-designed power center) it also gives you one huge advantage: You can replace it if something goes wrong. If, for some reason, you short the power center, just remove the drawers and replace it with another power strip—easy peasy. A bulk storage shelf can be located on the right or left and gives you a place to store batteries or even chargers. Speaking of chargers, I use the Milwaukee rapid charger station, but the 60-inch work station gives you mounting points to hang a couple Milwaukee M18 & M12 multi-voltage chargers right underneath the power strip. Each of the 11 drawers on the Milwaukee 60-inch mobile work station can hold up to 100 pounds—except the bottom drawers which can handle 200 pounds. Overall, that gives this tool storage system a 2200-pound overall capacity. Even fully-loaded I was able to move it around the shop’s 3/4-inch plywood floor—a testimony to the well-designed frame and excellent casters. And just above each of the casters is a nice corner bumper (you put these on during assembly) to protect your other shop furniture from potential dings. The two bottom drawers are nice and deep—able to store power tools, hole saws, or other larger products. Milwaukee even included a movable divider for the large center drawer so you can customize it a bit to fit your needs. On the right, a removable custom insert is set up to handle drills and drivers. The locking door on the left side of the Milwaukee 60-inch mobile work station gives you a handy storage cabinet with a height-adjustable center shelf. All three locks are keyed together, so the top drawers, bottom drawers, and door won’t require separate keys. I loved the soft-close action on the 60-inch Milwaukee mobile work station drawers. Even fully-loaded, they’re a pleasure to use. Nudge them shut and they’ll pull themselves in the last inch-and-a-half. That really beats the shoving and slamming I’ve experienced with other storage chests and tool storage solutions over the years. Another added benefit with this system is that opening drawers becomes a more deliberate process (you have to “defeat” the retraction system on open). With a more deliberate process you’re less likely to have more than one drawer open at a time (a potential safety hazard—though less so on horizontal storage than with vertical tool chests). This top drawer is loaded down with various hammers and pry bars and still closes gently and smoothly. Of course, you do have other new tool storage options from Milwaukee. The Milwaukee 30-inch steel storage chest and cabinet is very much the little brother of their 46-inch unit. Starting from the top, you’ll find a pneumatic lid with 9.5 inches of head clearance. The popular metal peg board is back, but you won’t see a power strip in the upper interior of this model. That’s on the exterior of the base cabinet. The table top drawer is back as well with the ability to work on a laptop or any other use you can find for a small desk space. There’s still locking storage beneath it for your device and documents. On the base cabinet is the previously mentioned power strip. Each of the 12 total drawers are rated for 100 pounds of storage. The deeper bottom drawer is separated into a bulk storage space and cordless tool organizer with space for for three drill/driver/impact style cordless tools. Both of these new Milwaukee tool storage systems are impressive, but for those with limited work space, the Milwaukee 60-inch mobile work station (48-22-8560) will give you the same storage as a vertical tool chest, but with the added benefit of the table top. This model should sell for around $599—making it a stellar value in our opinion. Milwaukee is definitely attempting to make a splash in tool storage with a product priced this low and built to this level of quality. Everyone who’s seen this unit has either commented about how great it looks—or threatened to steal it while I’m sleeping… If you want a smaller footprint without the top surface, the Milwaukee 30-inch steel storage chest and cabinet (48-22-8530) will run you $499. Keep your eyes open for these Milwaukee storage solutions to arrive at Acme Tools! Ben Buenrostro Hook it up!!! !